Hello everyone! While we are traveling and exploring Poland I thought I’d share one more project created using goodies from the Simon Says Stamp July Card Kit. If you’ve missed my You’re a Lifesaver Project you can check it out here. I started working on this card by die cutting a rectangle out of white cardstock using the the SSS Stitched Rectangles dies. Its one of my most favorite die sets from Simon and I seem to use it on nearly half of my cards! I wanted to have a little scene on my project so I created a mask for the waves. I stamped those in Memento Tudexo Black ink, masked them and stamped a sail boat on top. 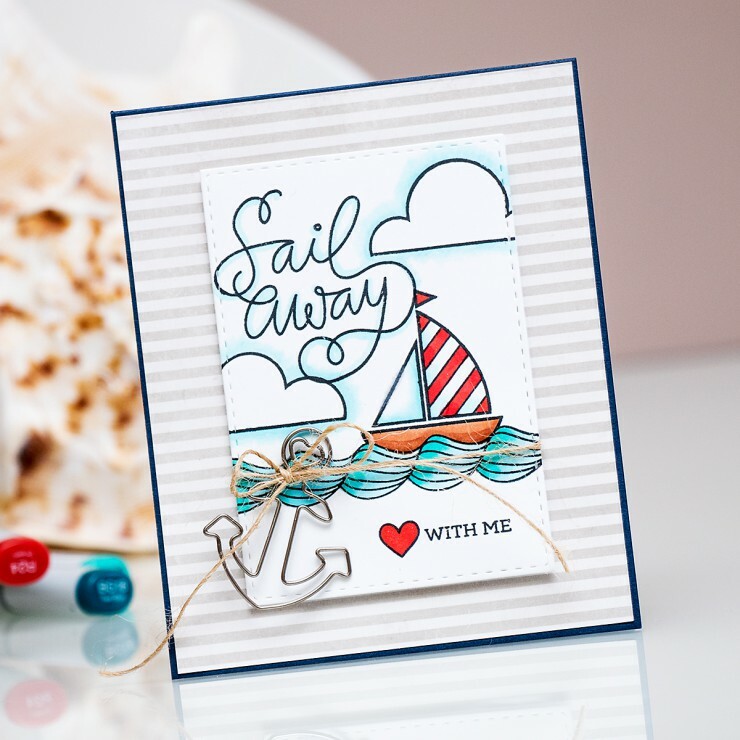 I also added a few clouds and a beautiful Sail Away sentiment. I used Copic markers to color all of my images; I had a little bleeding disaster on one of the sails, I have no idea how it happened, but the black Memento ink bled everywhere and the only way I was able to fix it is by coloring on top with a white gel pen. I also added some natural twine and a fun little Maya Road Anchor Shaped Paper clip. I next adhered my colored rectangle onto a sheet of grey stripped patterned paper and added that onto a card base created using Simon Says Stamp Soft Navy cardstock. 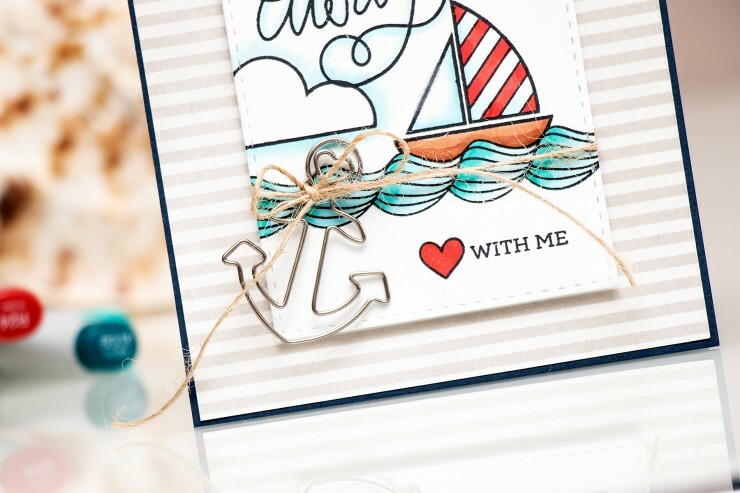 I’m hoping to do some more stamping using the images from this kit as well as the little Sail Boat die, I think its just adorable! Hugs! This is amazing Yana! I love the little details, and the happy colors you used! Great card!Have a good trip! Листівка дуже класна, така літня. Набір штампів дуже гарний, а особливо мені напис сподобався. This card is fabulous Yana! I love all of the wonderful details you added to make it pop!